Obesity has become one of the greatest public health concerns worldwide and is known to be the most important risk factor for obstructive sleep apnoea (OSA). Prevalence of OSA has increased over the last two decades, but it is estimated that the majority of cases still remain undiagnosed. The aim of this study was to investigate the prevalence of OSA in Finnish bariatric surgery candidates. In this prospective multicentre study, standard overnight cardiorespiratory recording was conducted in 197 consecutive patients from three different hospitals. A sleep questionnaire was also administered. Anthropometric and demographic measurements included age, weight, body mass index (BMI) and waist and neck circumference. Altogether, 71 % of the patients were diagnosed with OSA. The prevalence was higher in males (90 %) than in females (60 %) (p < 0.001). 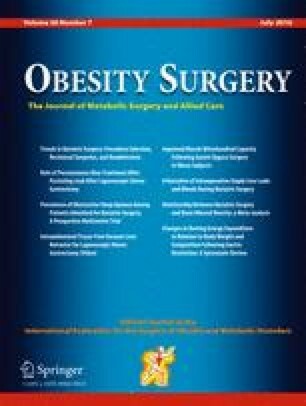 In OSA patients’ group, the mean neck and waist circumference was larger (p < 0.001) and the body weight higher (p < 0.01) than in non-OSA group. When separating patients by gender, a significant difference remained only concerning neck circumference in female patients. OSA is very common among bariatric surgery patients, especially in men. Considering this and the increased long-term morbidity and mortality generally related to OSA, a routine screening for OSA seems indicated in bariatric patients, particularly men. The authors cordially acknowledge Miia Artama, PhD, for her critical assistance with statistical analysis; Jaana Elberkennou, MD, MA, for her kind revision of the English language and the clinical research nurses Synnöve Liukku, Helinä Mäkipää, Taina Poutiainen, Matti Laitinen and Marjo Soini. All procedures performed in this study were in accordance with the ethical standards of the national research committee and with the 1964 Helsinki Declaration and its later amendments or comparable ethical standards.